3:05 pm Game at the Dunkin Donuts Center in Providence on Sunday, May 14th. 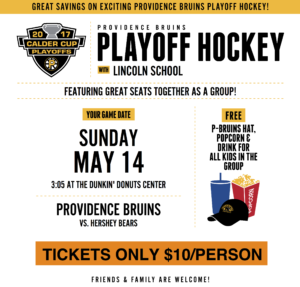 Children will receive a P-Bruins baseball hat, popcorn and drink. If interested, please complete the attached flyer (order form) and place flyer, along with a check made out to Lincoln School PTO, in the basket in the office by 9:00 am on Tuesday , May 9th.